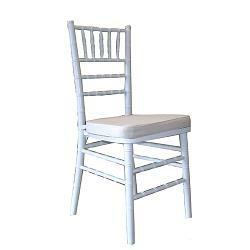 Chiavari Chairs available in gold, white, silver, natural, cherry, maple or black. Pad colors available in black, white or ivory. Minimum order of 30 chairs. * Please call us with any questions about our chair chiavari white rentals in Sedona, Cottonwood, Camp Verde, Prescott Valley, Chino Valley and surrounding metro areas.